Our Grandmas Oven Fried Chicken recipe is a recipe passed down through at least 3 generations to Cheryl. The only change are the spices we use. Way back, both of our families and probably many of yours, only used salt and pepper to season many of their foods. Back in Europe, our families ate and cooked simply. This tradition was passed on, but we now use many spices, which can change the recipe just by changing the spice combination. This recipe uses our Chive Pepper Seasoning for a very savory, flavorful chicken. The spice and herb combination starts with salt and pepper but adds others to build a flavor which makes it hard not to finish the entire plate yourself. The pan juices provide a base for one of the best tasting gravies you have ever had as well. Add a side of roasted or mashed potatoes, roasted carrots, and a mixed salad and you have the kind of traditional Sunday chicken dinner we grew up with. Cut up the whole chicken into 6 pieces. 8 pieces if you cut the breasts into 4 pieces. Cutting up you own chicken saves you quite a bit compared to a pre-cut chicken. If you have not cut one up, its simple. You can find instructions in most cookbooks, or online. In a large mixing bowl, dissolve the salt into the cold water. Transfer the chicken pieces to the bowl, cover and refrigerate the chicken for an hour. This makes the chicken juicier and more tender. It also allows the flavors to cook deeper into the chicken. Preheat oven to 400 degrees, positioning one rack near the top of the oven. While heating the oven, on a large, low sided cookie sheet melt your stick of butter. Remove the chicken from the brine, rinse the pieces and pat dry. Season the chicken pieces with 1 tablespoon of the Chive Pepper on one side. In medium bowl, place the 1 cup of flour. Coat the chicken one piece at a time in the flour. Lay each piece, seasoned side down in the melted butter. 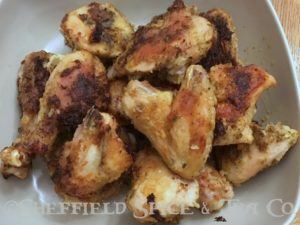 When all the chicken has been coated and placed seasoned side down in the pan, season the top of the chicken with another tablespoon of Chive Pepper. Place on the oven top rack for 30 minutes. Turn and bake for another 30 minutes. Mashed potatoes and gravy are a great side dish. To make gravy, transfer the chicken to a plate and loosely cover with foil to keep warm. Place the cookie sheet on the stove top. Turn the heat up to medium-high. Add 2 to 3 cups of water to the pan and de-glaze any browned bits. You may add 2 chicken low-sodium bouillon cubes for more chicken flavor. In a shaker container add 2 tablespoons of flour and a cup of cold water. Shake until well blended. Stir slowly into the liquid, scraping any remaining cooked bits from the bottom of the pan. Cook for 2 or 3 minutes, stirring constantly until thickened. Strain through a mesh strainer for smoother gravy. Plate the chicken with the potatoes, gravy and any other vegetable you might have made. Now THAT is a Sunday dinner!